Snippets of Jack: "Look! An undead monkey. Top that!" For all those who love the amazing Captain Jack Sparrow...Oh and his totally awesome crew. "Look! An undead monkey. Top that!" "Would you do it? Hm? What would you…hm? What would any of you be willing to do, hm? Would you sail to the ends of the Eart' and beyond, to fetch back witty Jack and him precious Pearl?" Every Captain needs a good first mate. "What the Black Pearl is, is Freedom"
"Do you think he plans it all out or makes it up as he goes along?" "Do We Have An Accord?" "Dying is the day worth living for." Who is your favorite character from the novel Pirate of the Caribbean: The Price Of Freedom? Why is the rum always gone? Thanks for Checking Us Out! 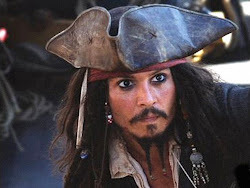 "My first and only love is the Sea"
We Love Captain Jack Sparrow!. Simple theme. Powered by Blogger. Don't Forget To Vote On The Poll!